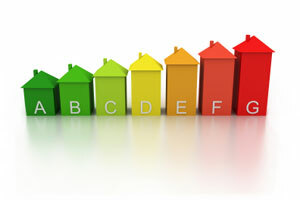 An EPC or Energy Performance certificate is an efficiency assessment of your home, and looks at the energy required to heat or cool your house as well as providing hot water and lighting. How well your house is insulated and the type of heating you have will effect this. Using Solar energy to either produce electricity or heat water can help to give you a better EPC rating. In order to qualify for the maximum rates of Feed in Tariff since 1st April 2012 your property must have an EPC rating of ‘D’ or above. If your property is not currently at Level D or above you may find that installing Solar Panels will actually bring you up to level D.
If your property isn’t at level D even with Solar Panels it may be that extra roof insulation, cavity wall insulation or even simply insulating a hot water cylinder will be sufficient. Your EPC report will identify any areas for improvement, and suggest how to get to the required level or above. if you are not sure if your home is at level D don’t hesitate to call us and we can help arrange the assessment.